Javi here. I'm not going to lie; a big part of the reason I was so excited about THE SOCIAL NETWORK was that Nine Inch Nails front man Trent Reznor and his long-time collaborator Atticus Ross. When the movie came out, I couldn't believe that the guy that wrote THE FRAGILE had created something some eerily beautiful, but I guess that's what age and sobriety do to any goth kid. But this year, the two musicians have teamed up with SOCIAL NETWORK director David Fincher for his new movie THE GIRLWITH THE DRAGON TATTOO, which has me all sorts of excited again. And we just got our first look at the cover. Man, that is one slick looking silhouette. According to NIN.com, the soundtrack will be released in Mute Records and on Reznor's own Null Records here stateside. No real release date has been announced, but Reznor did say to look for an announcement on December 2. 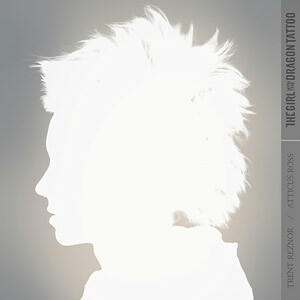 THE GIRL WITH THE DRAGON TATTOO comes out December 21st. It's directed by David Fincher. It stars Rooney Mara, Daniel Craig and Stellan Skarsgard.